Beekeeping 101: Getting Started (2 hours) This is the perfect class to learn more about bees and what it takes to become a beekeeper. This class is a prerequisite for the 201 Class. This class is the second in our 3-part series on becoming a beekeeper. In this class you will learn bee management strategies so that you are ready to pick up your bees and begin your new hobby with confidence! We will demonstrate the various skills from hiving a package, feeding your colonies, how to recognize pests and diseases, preventing swarming and harvesting the honey. Every class includes an observation Hive Tour in the apiary and Honey Tasting! 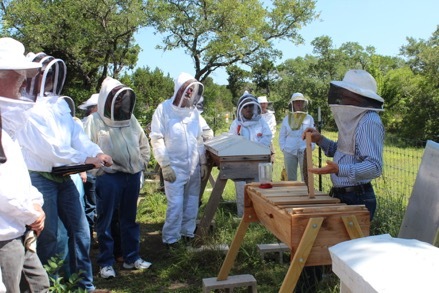 Beekeeping 301: Hands-on learning in a small-scale bee apiary. (2-3 hrs) Small classes to increase learning and contact with bees. This is the class for someone who has committed to keeping bees, is ready to get started, already has their hive and/or bees, needs a refresher course on what to do and when, or just wants some hands-on experience with working bees in the hive. You MUST have taken 101 and 201 or equivalent beekeeping class in order to be successful in this class AND to work with my hives. This is an advanced learning class and we won’t be able to repeat what you should already know from 101 and 102 above. This class is outside in full beesuits working directly with the bees. We will work with Top Bar hives and Langstroth hives, unless you only choose to learn one. Working in the apiary – first watching then performing a hive inspection in both Langs and TopBar hives. * Hands-on classes may need to be rescheduled if weather is adverse for bees. *** ALWAYS CHECK WEBSITE TO SEE IF HANDS ON CLASSES (301 Class) ARE STILL ON. We can’t work the bees if it’s too cold, too wet, too rainy, too windy, etc. I try to email everyone signed up for classes a day or two before to let you know that the class is still on. When in doubt, please email, call, or text Tanya to make sure class is still happening.